You'll be £6.00 closer to your next £10.00 credit when you purchase The BEF in France 1939-1940. What's this? The British Expeditionary Force (BEF) was the British force in Europe from 1939–1940 during the Second World War. Commanded by General Lord Gort, the BEF constituted one-tenth of the defending Allied force. The British Expeditionary Force was started in 1938 in readiness for a perceived threat of war after Germany annexed Austria in March 1938 and the claims on the Sudetenland, which led to the invasion of Czechoslovakia in March 1939. After the French and British had promised to defend Poland, the German invasion of that country began and war was declared on 3 September 1939. The BEF was sent to France in September 1939 and deployed mainly along the Belgian—French border during the so-called Phoney War leading up to May 1940. The BEF did not commence hostilities until the invasion of France on 10 May 1940. After the commencement of battle, they were driven back through Belgium and north-western France, forcing their eventual evacuation from several ports along the French northern coastline in Operations Dynamo, Ariel and Cycle. The most notable evacuation was from the Dunkirk region and from this the phrase Dunkirk Spirit was coined. My most recent read is another stunning hard back publication from Pen and Sword Military Books. I had the pleasure of reviewing another book by these two authors a while ago and found it to be as equally well researched. 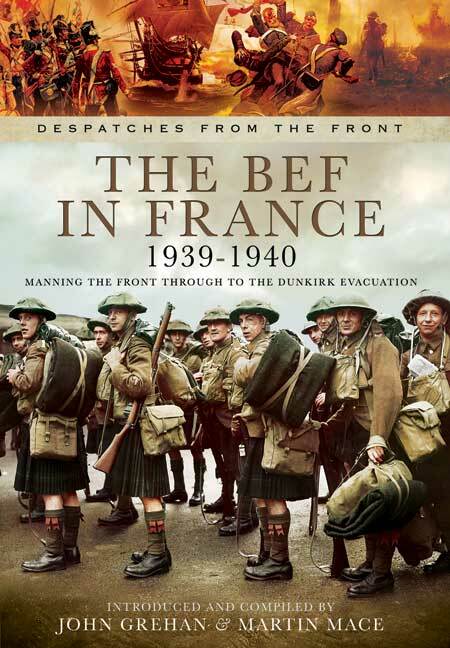 This enlightening read discusses in detail, the British Expeditionary Force (BEF) landings in Northern France from 1939 through to their timely, if not chaotic, evacuation in 1940. The authors look at the force dispersion, its supply, defensive operations and eventual retreat. ... The authors discuss the hugely impressive and now legendary ‘Miracle of Dunkirk’ - the mobilisation of vessels of all sizes sent from Great Britain to assist in the evacuation. An estimated total of 330,000 servicemen were transported from Dunkirk to the safety of English shores. The book concludes with a concise narrative of Operation Dynamo. This book should be seen as a valuable reference for anyone interested in this fundamentally decisive part of the Second World War. Warmly recommended ... a most interesting compilation. What stands out is the decisive thinking of senior British Commanders who recognised the developing risks and were prepared to take the unwanted decisions to evacuate British and French troops from Dunkirk, leaving France to suffer occupation and partition, but save Britain as a bastion from which to eventually strike back in the liberation of France and defeat of Germany. Three interesting perspectives on these significant events in the story of the BEF and a handy reference as well. Informative and useful commentary on the events and decisions taken in 1940. Compelling reading and give[s] a new perspective to events.